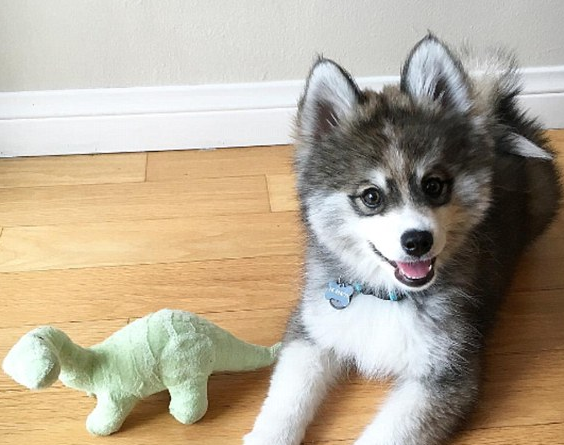 The adorable puppy, who is featured on the Instagram account, Norman the Pomsky, is swiftly becoming social media's next big animal celebrity. Norman was adopted by his owners Rachel and Matt in May. Almost immediately after picking up their new addition, the couple created an Instagram account for Norman, showing off his sweet fluffy face and cute features that include a set of dark rings surrounding his little eyes. The first post, shared on May 6, sees the fluffy pup lounging in a grey bed and looking absolutely delighted to be wearing his new collar bearing his name. In fact, in just six weeks since his first post, the Pomsky puppy has amassed over 11,000 followers on Instagram. And fans just can't seem to get enough, with one writing: 'I melt... cuteness overload' and dozens of others asking the owners where they could get their own dog. According to PetGuide.com, the breed is already considered to be 'the hottest pup of 2016'.